Have any of you checked out the YouTube Video, "Detect exoplanets by yourself with the cheapest equipment" by The Exoplanets Channel? This looks like a fun thing to do but have a few questions for those that have given it a shot. The data I have for the HD 189733 would work fine, but it isn't as 'perfect' as I'd like. There is a null spot where a cloud blanked out the data, and that seems like a key location in the data. Selecting on some stars as the reference point errors out... Possibly over exposure? The time is in UTC, and they give you different color font to indicate, Transit occurs below 20° in the sky, During the daylight and Observable. But when I convert the UTC time into Central time, the Observable times are during daylight... maybe because my Lat/Long is off??? Maybe not part of the calculation? Anywho... If any of you have loaner data... understand how to better input my Lat/Long for here in Iowa, USA... make it easier to convert to Central Time... I'd appreciate it! Our longitude is actually negative (my house is -90.591 , which is also 90.591 W, where W is negative. East is positive). Since they seem to ask for a 0 to 360 long, maybe one needs to calculate the absolute long going EAST to our location? SO 180.000* + (180.000* - 90.571) = 269.409* ish. Would that make sense ??? Or just try the negative sign value and see if that helps. Edited by George Bailey, 18 March 2019 - 02:59 PM. There's an excellent reference on the AAVSO's web site. 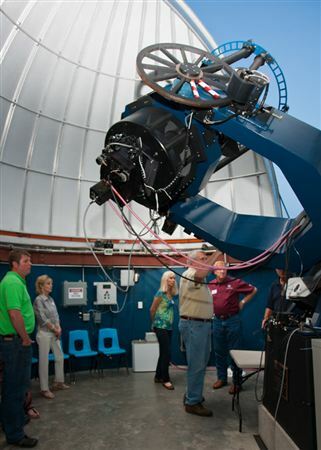 Go to https://www.aavso.or...serving-manuals and check out Dennis Conti's Exoplanet Observing Guide. Also look at Conti's web site at astrodennis.com where you can find instructions to use AstroImage-J, data you can download to test things out and a number of presentations he's made to groups. AstroImageJ is pretty simple if ya just click on a few of the right things... I could use more sample data though... I'll check it out. Any ideas on why using some reference stars don't set a valid reference point while others do? What sort of data do you want? raw images or just numbers? Have you read through Dennis Conti's guide? Sounds like you may have corrupted data. Might try downloading it again. AIJ can be a bit particular in the image format and header info. This vid will give you a very basic, quick and dirty procedure to get a curve. using different reference stars shouldn't change the curve unless the reference star is variable also. Ideally you want to use several reference stars not just one. Edited by gavinm, 19 March 2019 - 03:43 PM. I've got a full transit of WASP 6b from a 0.6m that I took, but it's 257 FITS files (@ 541 MB) - anyone got suggestions how I can post this? After watching that video, I'm thinking that maybe the data is not quite as good as what I'd like to have. It will work if I stick to the target and that 1 reference star, but does nothing like shown in this video. Not sure how it can be posted here... can they be compressed and emailed? Dan, how did you get such clean data? What were your acquisition details and hardware? how are your error bars so small? All of my results (albeit with a 5 inch refractor) have had a really high scatter. Too high to be useful imo. Also, what is the SNR of your target in each image, on average? My club has a research grade observatory with a 24" f/9 RC and a Princeton Instruments Pixis 2048 camera capable of cooling to absolute temps as low as -70C. We can obtain mmag photometry on objects as faint as 16 mag with 30 sec images. 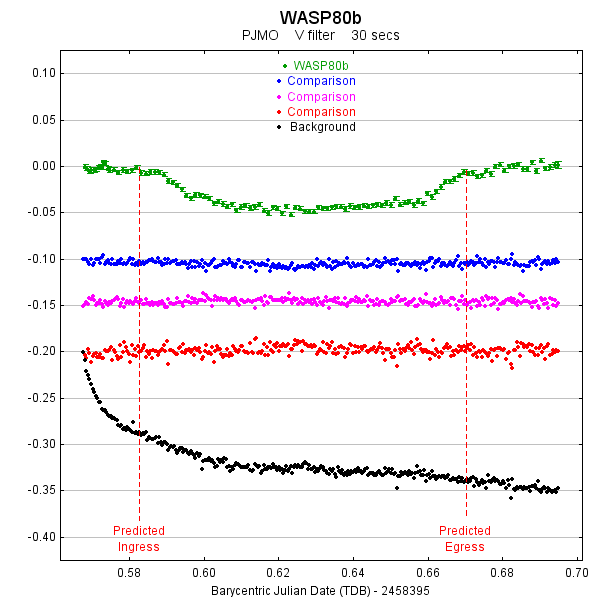 We usually get reliable photometry with target SNRs as low as 200 counts above the background but have gone as low as 100 before and still gotten useable data. The real trick to getting small error bars is not only having good equipment but getting good calibration. Despite not technically needing darks or bias, we take them anyway. Edited by StarmanDan, 25 March 2019 - 02:49 PM.